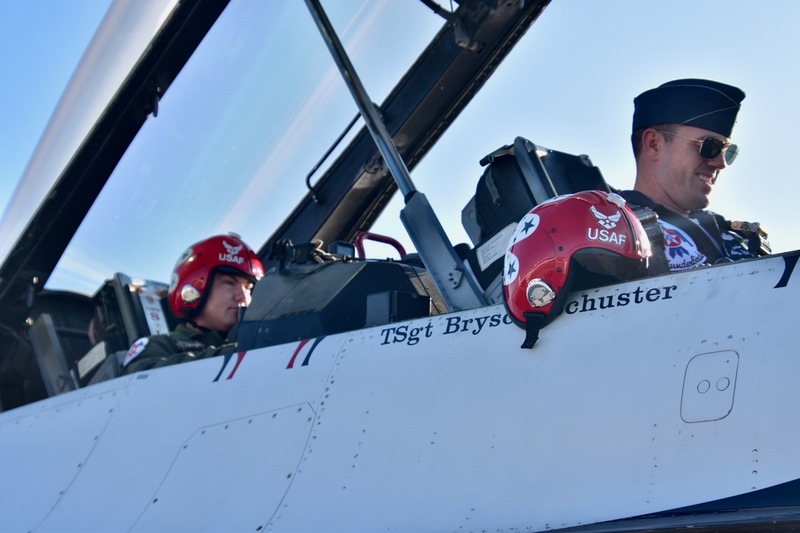 The United States Air Force Thunderbirds are known for their mission to recruit, retain and inspire future airmen. 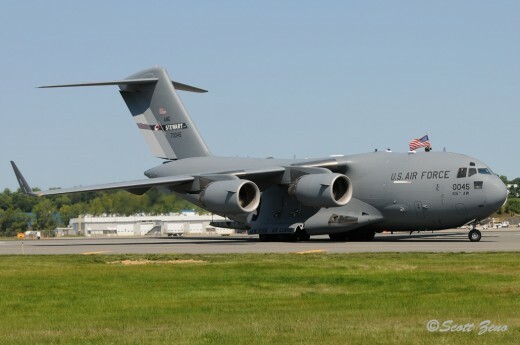 It is also their goal to honor local heroes at each air show they attend. 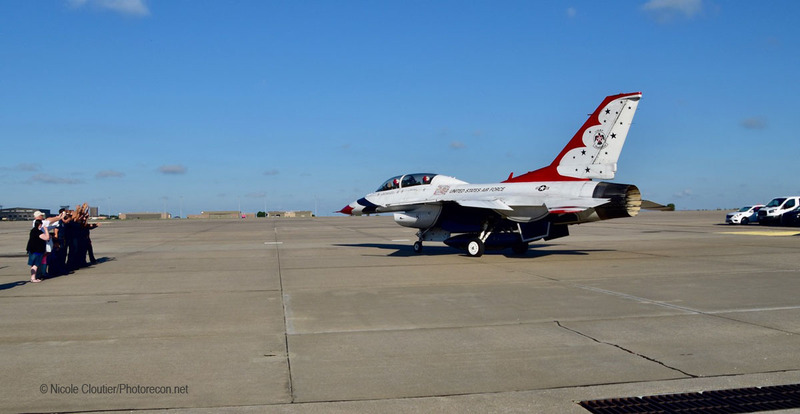 On September 8th, 2018 at the Frontiers In Flight air show in Wichita, KS they did just that. 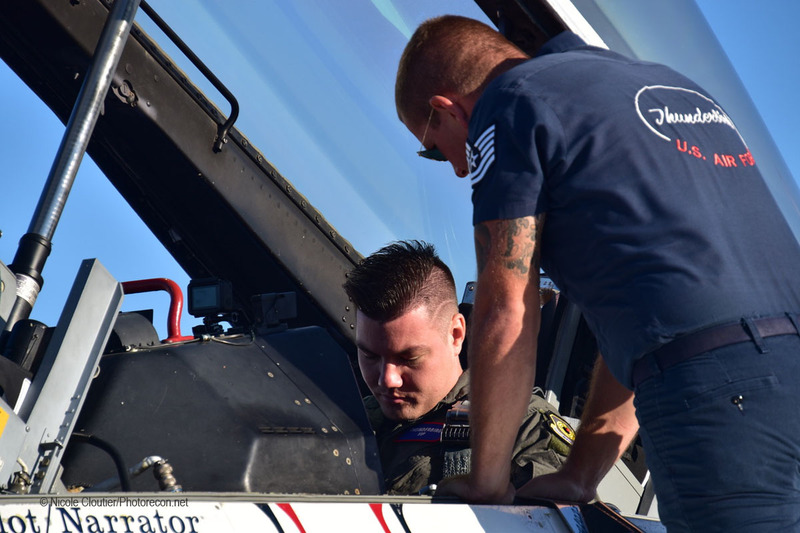 When asked by the team, PA Officer Lt. Daniel de La Fe of the 22nd ARW knew just who he would nominate for their Hometown Hero flight: Officer Alex Bieler of the Wichita Police Department. On May 11th, 2018 Officer Bieler saw a woman emerge from a restaurant in flames. Without hesitation he pulled over and immediately started extinguishing her with his bare hands. “I really wasn’t sure what I was going to do,” Bieler said. “I probably could have thought it through better, but I just ran up to her and started patting her down. I started on her head and it went out when I started patting down her head, so I just kept going.” Once she was taken care of, he used a baton from his cruiser to smash a glass door and attend to another woman who was also badly burned. Both women were rushed to the hospital, as was Officer Bieler who suffered second-degree burns to both his hands. After only 5 days, with bandages on his hands, he returned to patrol the City of Wichita. 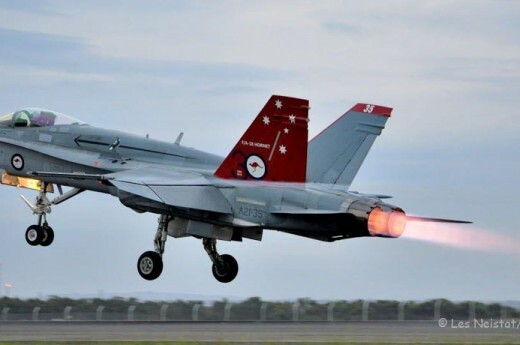 Their planned Friday flight cancelled due to low ceilings but they rescheduled for Sunday morning before the show. Officer Bieler arrived to find his name affixed to the jet. 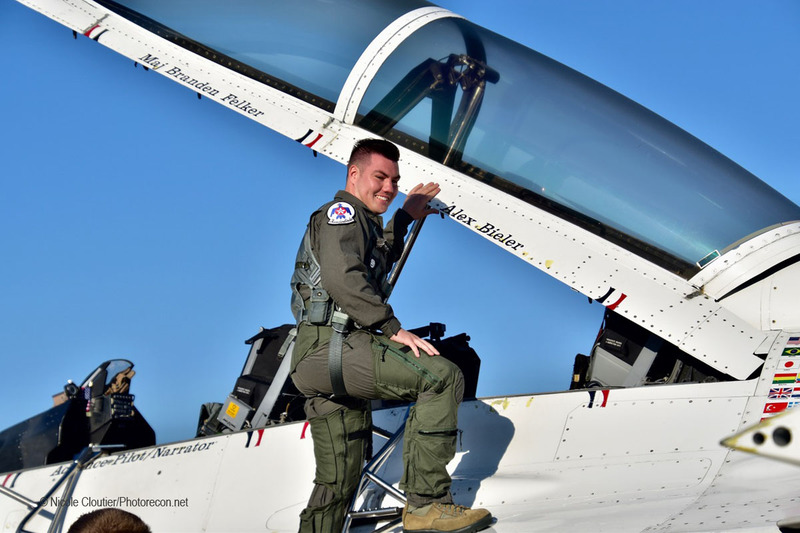 He flew with Thunderbird #8, Advance Pilot Major Branden Felker. I asked Sgt. 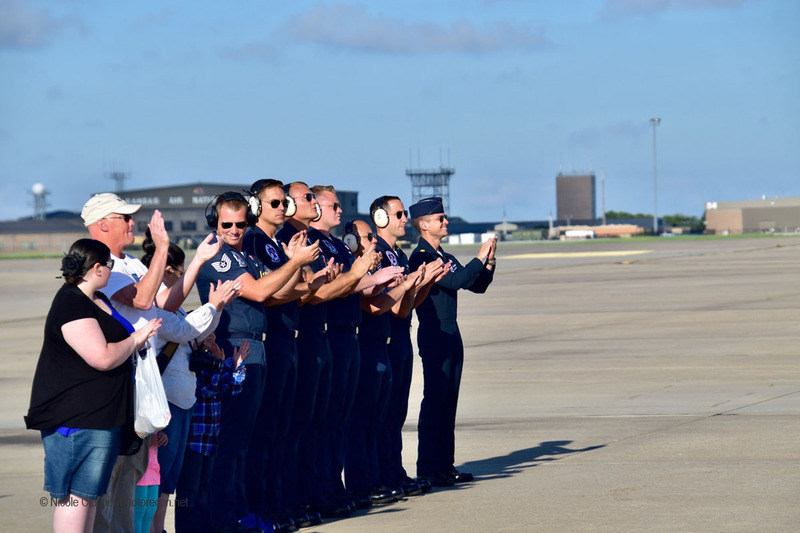 Stephanie Englar, their NCO of Community Engagement, what a typical flight is like for these chosen heroes. “They are up for about an hour doing the whole show. When we brief them they can request certain maneuvers or remove ones they may not be comfortable with. This ride is for them, and we try to make it as special as possible.” The flight is performed away from the air show area is generally done in an MOA where they’re free to perform without disturbing residents. Officer Bieler looked elated as he suited up and was given last minute guidance from the team and Major Felker. He was joined by his family and his young niece and nephew who remarked, “He was the coolest”. 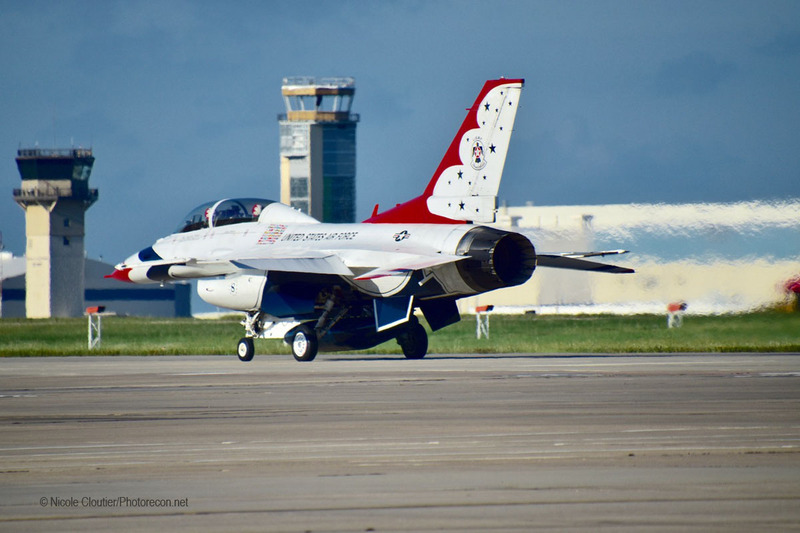 As they taxied off, we all clapped and wished him well as he soared high into the skies for a ride of a lifetime in a Thunderbird F-16. I caught up with him after the show to ask how the flight was. “It was an amazing experience-nothing compares to it. I kept expecting to get nervous but I never did. The briefing was good, everybody did a great job of making me feel relaxed and prepared. As far as the flight itself I loved every bit of it and was ready to go again as soon as we landed. Ash (my pilot) made sure I was handling all the maneuvers okay. My favorite was the corkscrew and he made sure we got to do that more than once. 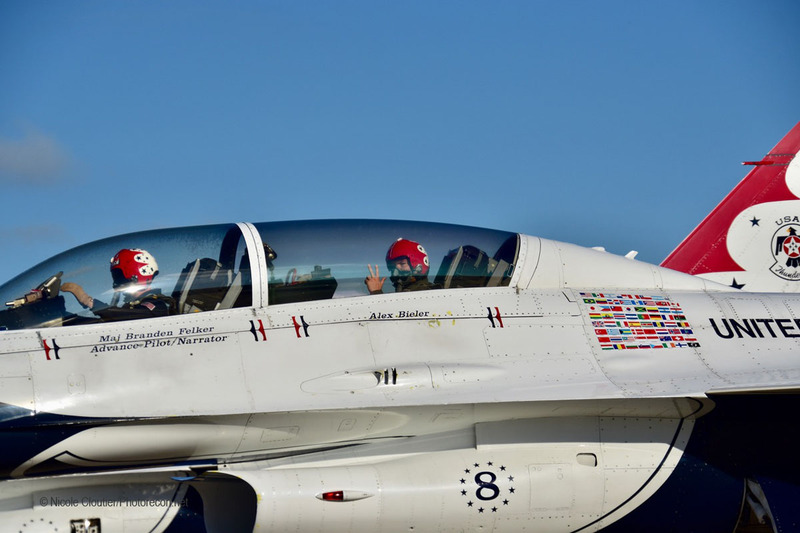 He let me take control of the jet and roll it-now I can say I’ve flown an F-16! 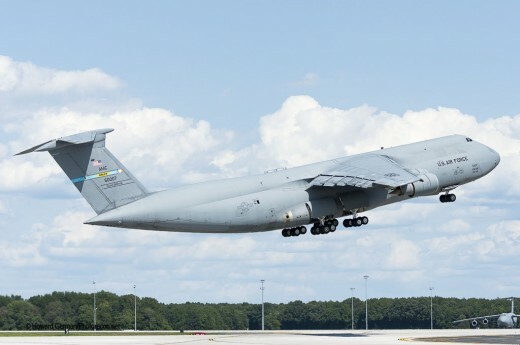 Next time you’re at an airshow, pay special attention to the hometown hero flights as they’re really something special to witness. 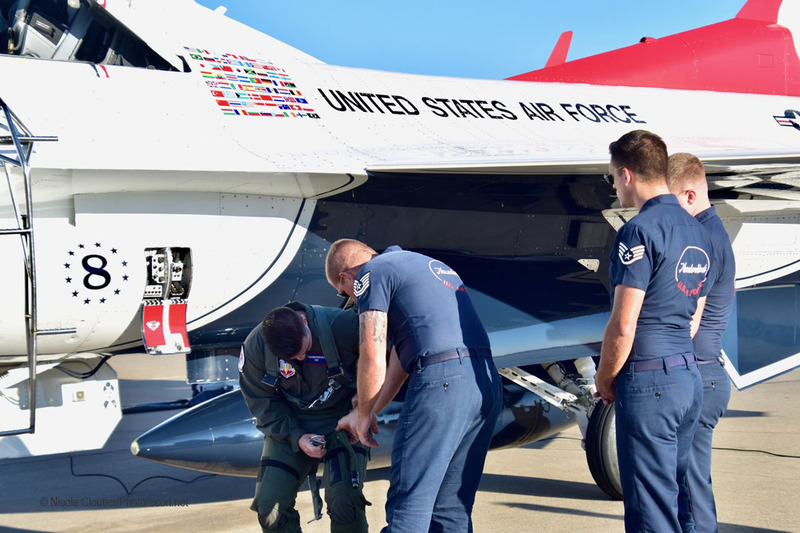 Officer Bieler and the airmen of the United States Air Force exemplify sacrifice and dedication to protecting and serving the people and upholding their missions. Special Thanks to Lt. Daniel de La Fe and Sgt. David Bernal del Agua of the 22 ARW, Sgt. 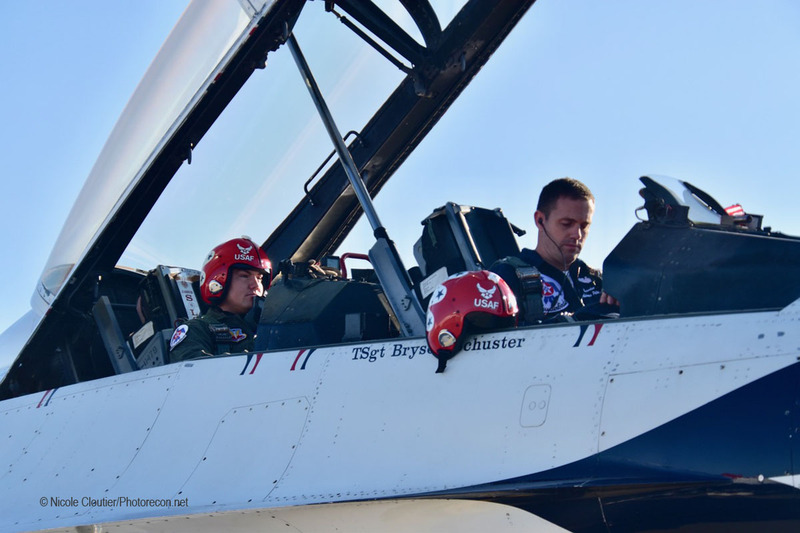 Stephanie Englar of the USAF Thunderbirds and Alex Bieler of the Wichita PD.